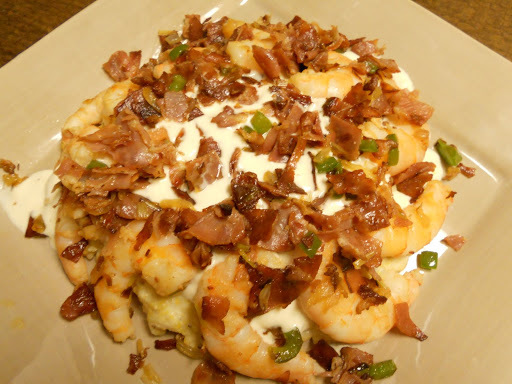 We finally tried the southern classic…Shrimp and Grits! We aren’t experts on this dish, but it turned out pretty dang tasty if we do say so ourselves! We got the recipe from Jeff’s assistant principal and the grits from Anson Mills. This is definitely a recipe we will try again soon (and we’ll remember that grits take a looooong time to cook!)! Cook grits according to package directions – use ½ the water called for in the directions and replace the other ½ with heavy cream – this makes your grits really creamy; set aside and keep warm. Heat oil in a large skillet over medium-high heat. Add prosciutto and saute until crisp. Add diced vegetables and saute until onions are translucent. Add shrimp and saute for 30 to 45 seconds, or until pink. Remove from the pan and set aside. Deglaze the pan with a little white wine. Slowly add the cream and let reduce until thickened. Season with salt and pepper, to taste. Divide grits among 2 serving plates. Line plate edges with shrimp (10 shrimp per serving). Pour sauce over grits. Garnish with green onion tops.